Each CTM customer receives a dedicated account team with extensive experience in corporate travel management. Our account managers know how to extract, analyze and present the right information to help your organization get the most value from your travel budget. 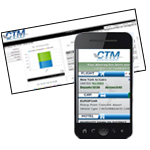 From maintaining compliance measures that maximize savings to sharing new options that best fit your travel patterns and company culture, CTM's experts are wholly accountable for your travel program results. Online – Use our online booking tool to compare, book and track the lowest air, hotel and car rental rates. VIP – Your executives can enjoy personal attention and service with a dedicated CTM representative who will offer more specialized attention. Meeting Planning – Specialty event and corporate meeting planners take care of booking, planning and facilitating your events from beginning to end. Travel Policy Compliance - Our approach to customized travel management ensures that your travelers are always in compliance with your Travel Policy. 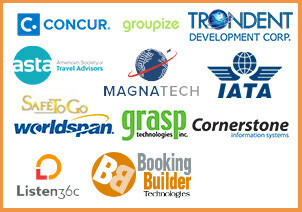 Customizable Booking Tool – Our unique booking tool is as customizable as you need it to be, offering direct access to all airlines, preferred vendor setup, travel policy tracking, unused tickets application and more. Traveler Education – Our methodology for continuous communication and attention to detail earns us the reputation for successful program implementation time after time. Safe to Go (powered by FlightStats) – CTM provides all travelers with the option of real-time flight status advisory notifications via your cellular phone, PDA or email. Mangement can track employees location and assist them in times of inclement weather, disturbances or other emergency. Cliente never need to worry about how to locate and secure their employees. The Details – VIP service, passport & visa expedition and round-the-clock service including e-ticket tracking, quality control, online booking, 24-hour emergency service and more. Optimized Expense Reporting - Our extensive financial reporting will allow you to track expenses easily, manage travel policy exceptions and unused tickets and apply them to your financial statements, turning company expenses into company savings. Fast, Electronic Communications - Electronic invoicing, itineraries, reporting and banked ticket monitoring are just some of the ways we will expedite communications about your corporate travel. Unused Tickets – Our QC system will automatically locate unused tickets for a traveler within the system, and prompt the agent to apply it to their trip if possible. Travelers are also notified with Concur Travel of unused tickets available to them. For complete QC we notify each client with a report that notates which travelers have credits, their value, and expiration date. Just one of the many ways we optimize your cost savings!